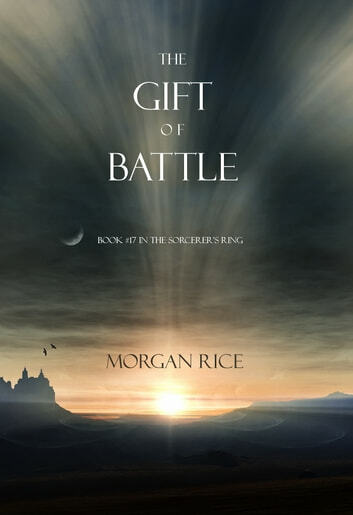 THE GIFT OF BATTLE (Book #17) is the finale of the Bestselling series THE SORCERER'S RING, which begins with A QUEST OF HEROES (book #1)—a free download on Kobo! In THE GIFT OF BATTLE, Thor meets his greatest and final challenge, as he quests deeper into the Land of Blood to attempt to rescue Guwayne. Encountering foes more powerful than he ever imagined, Thor soon realizes he is up against an army of darkness, one for which his powers are no match. When he learns a sacred object may give him the powers he needs—an object which has been kept secret for ages—he must embark on a final quest to retrieve it before it is too late, with the fate of the Ring hanging in the balance. Gwendolyn keeps her vow to the King of the Ridge, entering the tower and confronting the cult leader to learn what secret he is hiding. The revelation sends her to Argon, and ultimately to Argon’s master—where she learns the greatest secret of all, one which may alter the destiny of her people. When the Ridge is discovered by the Empire, the invasion begins and, under attack by the greatest army known to man, it falls on Gwendolyn to defend, and to lead her people on one final, mass exodus. Thor’s Legion brothers, on their own, face unimaginable risks, as Angel is dying from her leprosy. Darius fights for his life beside his father in the Empire capital, until a surprise twist prods him, with nothing left to lose, to finally tap his own powers. Erec and Alistair reach Volusia, battling their way upriver, and they continue on their quest for Gwendolyn and the exiles, as they face unexpected battles. And Godfrey realizes that he must ultimately make a decision to be the man he wants to be. Volusia, surrounded by all the power of the Knights of the Seven, must put herself to the test as goddess and discover if she alone has the power to crush men and rule the Empire. While Argon, faced with his end of days, realizes the time has come to sacrifice himself. As good and evil hang in the balance, one final, epic battle—the greatest battle of all—will determine the outcome of the Ring for all time. With its sophisticated world-building and characterization, THE GIFT OF BATTLE is an epic tale of friends and lovers, of rivals and suitors, of knights and dragons, of intrigues and political machinations, of coming of age, of broken hearts, of deception, ambition and betrayal. It is a tale of honor and courage, of fate and destiny, of sorcery. It is a fantasy that brings us into a world we will never forget, and which will appeal to all ages and genders. THE GIFT OF BATTLE is the longest of all the books in the series, at 93,000 words! great series...you won't be disappointed...once you start reading...its impossible to stop. Well worth the money. I have loved the whole series of The Sourceres Ring. I could not put the books down. I recommend them to anyone who likes excitement and different plots. This book was a great read except for one small problem. I found that Thor had too many moments of "He had never felt such power" or "His strike was more powerful than ever before" and "He finally knew his true power" That was my big pet peeve in this book. Exciting finish to engrossing series with satisfactory outcomes for fascinating characters & storylines.